I know that this general topic has been covered before but I wasn't able to find a satisfactory answer to my question. We just completed our second modular (Parisian restaurant to go with Palace Cinema) and we are hooked! My kids wanted to display them in their room, which is great, as otherwise the would have to go into the basement playroom. I got the idea that they would look even better lit up--and would be able to double as a night light. My main concern is with overall brightness. I would love to be able to dim the lights to an appropriate level for them to sleep, but I am not seeing any options there. A second option would be able to control the lights so that some could on and others off. I am certain I am missing options, so if you know of any please let me know! I would be willing to DIY it, though I'd rather not do any soldering. Happy to program a raspberry pi though. How lo-tech do you want to go? Most of the lighting sets I have seen are actually several different looms, each terminating in an USB plug. So you could build them all into the model, but only plug in the ones required at the time. For example you could use just the lights on the limousine as a night light, then plug in the spotlights to show off the building. You wont find dimmers for LED lighting, but you could try placing them behind different coloured trans bricks, plates, or tiles. There is a thread somewhere with a discussion of why these lights look so bright in photographs, but are perfectly acceptable in real life. I don't remember the final conclusion, but there were plenty of people who had noticed this effect. There should be dimmable kits out there, dimming LEDs is trivial (anything from variable resistors to PWM control). Someone should kickstarter a digital lighting kit with this and other features if otherwise. You could also vary the power to the input in some way. You may want to note that LEDs are dimmable to a point, but then they just go out when the voltage gets too low. They won’t dim smoothly to dark like old fashioned bulbs. No, LEDs are very dimmable. You're thinking of LED light bulbs you screw into a lamp socket, which are limited by the internal power supply. Individual diodes (of decent quality) have a wide brightness range, either through current control (resistor or electronic) or PWM control. Yes, LEDs are easily dimmable. If you get the WS2812b style ones, not only are they continuously dimmable but you can also address them individually. Link them up to a simple programmer or arduino, and you could have the lights turn off in different modulars at different times, or downstairs lights go off and upstairs ones go on for a while, then go off. Or red lights come on at a certain time in the wrong part of town. Interesting, it looks like brickstuff’s led controllers do do dimming (and lots of other effects). I’ll probably look into them a little closer. I stand corrected. I was thinking of LED replacement bulbs. Do the LED dimmers that use PWM flicker? Yes they do - the p is pulse. However the flicker is so fast you cannot see it. What rate do they use? I’m one of those people who could always tell (and be annoyed) when someone’s computer monitor was set at 60Hz refresh rate. A string of LED Christmas lights flickers when I look at it. The flicker may depend on which LEDs are being used. The cheap battery-powered fairy lights I picked up just get dimmer as the battery dies, no flicker that I can detect. A couple of full-sized dimmable LED bulbs I tried flicker like crazy in one lamp but work great in another one. Of course the battery ones won't flicker, there's no AC, unless you mean they are electronic. DC driven LEDs PWM at several KHz, no worries there. 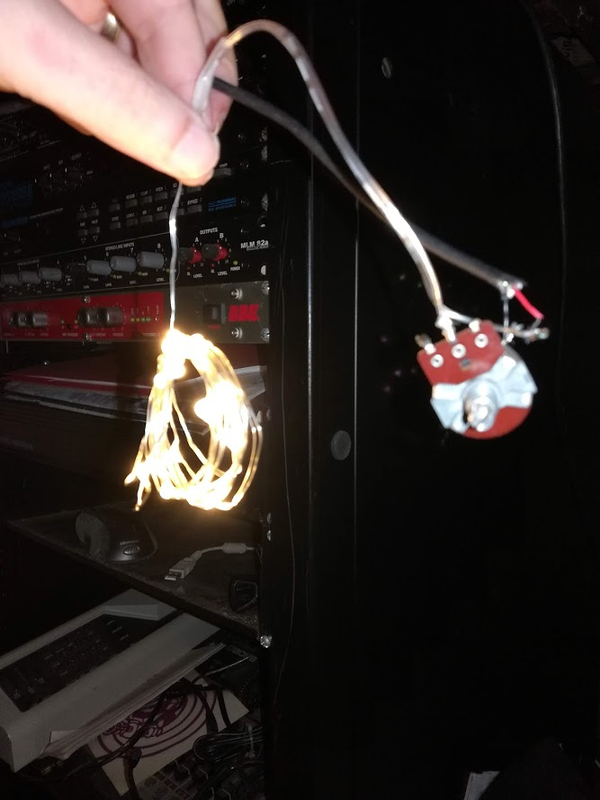 AC powered LED strings are a mixed bag. Some properly rectify the current and use HVDC and high frequency (or at least 120/100Hz from rectified mains). Some non-electronic strings are rectified as well. Others however, are cheap and nasty and PWM half the 60/50Hz mains with thyristers, meaning it's very visable. Apparently they are 10 kHz. I've never tested them but don't see any flicker at all, and you can continously vary brightness from full on to nothing. Have you tried LightMyBricks (LMB)? They are just like Brickstuff lights but much cheaper. I have some kits from Brickstuff that are amazing, but yes, very pricey. LMB has a great selection of kits and DIY and don't be deterred by them being in Australia, the shipping is fast. As far as dimming, I don't think LMB has a dimmer but not positive. You could buy the dimmer (and there is a remote) from Brickstuff because it is interchangeable with the LMB lights. The one thing to look out for, Brickstuff has 2 different size connectors. The "pico" connectors are the size you need for the LMB boards. It took me a few days to remember where my box of cheap, battery-powered LED fairy lights were hiding. I chopped the battery holder off of one set. Then I chopped one end off a USB cable and attached the red and black wires to the fairy lights, and now I have USB-powered fairy lights. I then added a pot from spare guitar parts for a dimmer switch. What? It was there this morning...sorcery! Reposting the picture. Apologies if if shows up twice. I'm seeing it in my original post and in @Astrobricks reply, but seems some of my pictures are not showing up. ^ Thanks. Now I see it. Still not there in the first post or my reply. I had started with lifelites a few yrs back but the brickstuff seems to maybe have taken over the market.